After shutting out Eastbound & Dahn in their second game of the season, Questionable Outfit continued to pitch well and play strong defense, beating Cookies & Cream 1-0 in their second consecutive shutout victory. Miller pitched the complete game, allowing only four hits, with no Cookies & Cream runner advancing beyond second base. Miller cruised through the top of the first, retiring Guthrie and Erich in order, and Questionable would give him all of the run support that he would need in the bottom half of the inning. 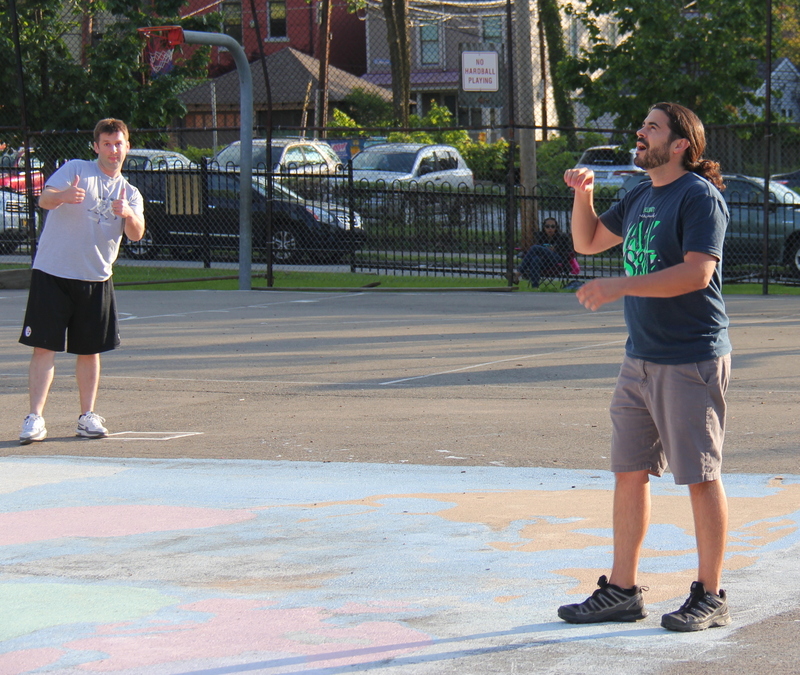 Les, making a rare appearance on the Wiffle Diamond for Cookies & Cream, took the mound against Questionable Outfit, and the first batter he faced, Bob, welcomed him back in style. Bob crushed a deep solo blast to right-center to lead off, and Questionable Outfit led 1-0 immediately. Les retired Tom and Mike to end the inning, but the damage was done. Les singled with one out in the top of the second, but Miller buckled down, retiring Guthrie to strand the runner and end the inning. Miller led off the bottom of the second with a double, but Questionable couldn’t add to their lead, as Les retired Bob and Tom to end the inning. Miller fanned Erich to start the top of the third, and after Joey hit a one-out double, Les was retired, and the Questionable lead remained 1-0. Rairigh singled to lead off the bottom of the third, but Questionable couldn’t plate him, as Les retired Miller and Bob to keep the score 1-0. Miller cruised through the top of the fourth, retiring Guthrie before striking out Erich for the second time in the game. 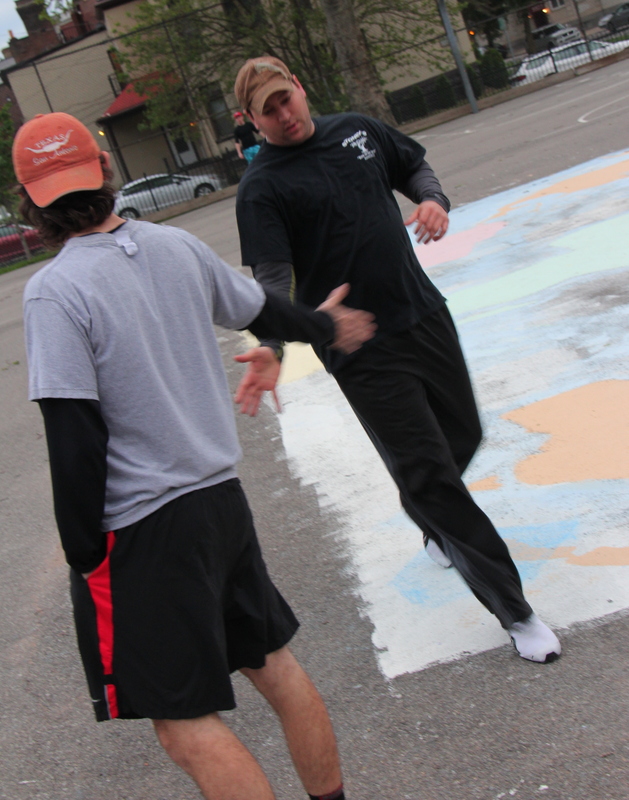 His offense couldn’t help him out, however, as Les matched him in the bottom of the fourth, retiring the side in order. Once again, Miller rolled through the top of the fifth, sending Joey and Les down in order, and the fast-moving game remained a one-run game. Les got into some trouble in the bottom of the fifth. Mike singled to lead off, and he moved to second when Miller followed with a single. Questionable had runners on first and second with no outs, but Les continued to pitch well, and his defense supported him. Bob flew out to deep right field, and Tom flew out to left, stranding both runners. Cookies would head into the top of sixth down a run with only two hits in the game. Miller stayed on the mound to close things out, and Cookies & Cream made it interesting. Jordan entered the game, and he singled in his first at-bat. Two batters later, Erich singled, putting runners on first and third with one out. The tying run was on third base, and Joey came to the plate. He rifled a line drive to left, and it looked as if Cookies were mounting a late comeback, but Kimble snatched up the ball just in time to record the second out, ending the game. The 1-0 win moved Questionable Outfit to 3-0 on the season, while the loss dropped Cookies & Cream to 0-3. – Miller pitched the complete game shutout win for Questionable Outfit, scattering four hits and striking out two in six innings. It was the second complete game shutout of his career. – Les took the complete game loss for Cookies & Cream. He gave up one run on four hits in five innings. – Bob’s solo homer to lead off the bottom of the first was the only run in the game. It was the fourth leadoff homer of his career. – Erich, Joey, Les, and Jordan each had one hit for Cookies & Cream. 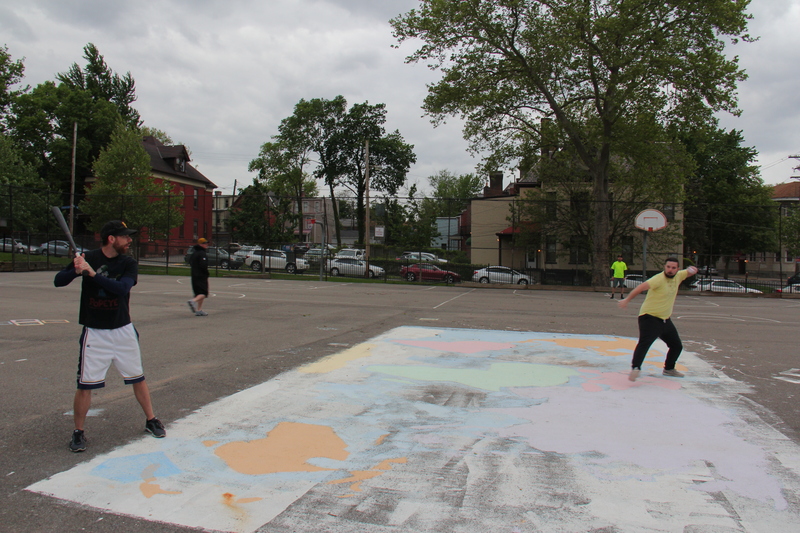 After three innings of the fourth game in week one, the Eastbound & Dahn vs. Questionable Outfit matchup was postponed due to darkness. The game was resumed in week 2, and Questionable Outfit cruised to a 7-0 win as Norris, Miller, and Mike combined to throw a shutout. Bob and Mike each contributed three hits, and Kimble homered in his first at-bat of the 2017 season. BK took the mound for Eastbound, and he avoided trouble early. After giving up a one-out double to Rairigh, he retired Miller to strand the runner and end the inning. 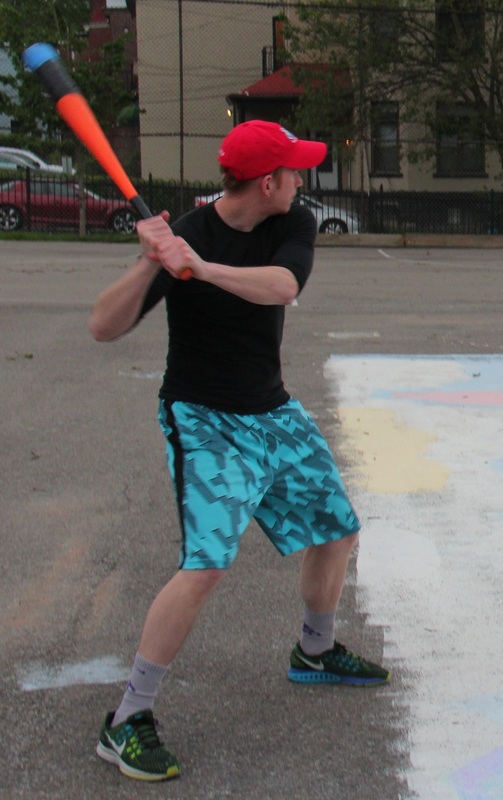 Norris made his first start of the 2017 season for Questionable Outfit, and he cruised through the bottom of the first, retiring the side in order. BK continued to pitch effectively in the top of the second. Bob singled with one out, but was stranded, as BK retired Rairigh to end the inning. Norris matched BK in the bottom of the second, and the game was scoreless through two innings. Questionable Outfit got on the board in the top of the third, finally cracking BK. Miller led off with a single, and two batters later, Bob doubled to drive him in and make the score 1-0. Rairigh followed with a one-out double to drive in Bob, and Miller then singled for the second time in the inning, scoring Rairigh. BK retired Norris to end the inning, and Questionable led 3-0. Mark led off the bottom of the third with a single, and two batters later, Nate singled to put runners on first and third with no outs. Eastbound had a chance to cut into the Questionable lead, but Norris got BK to groundout to left, ending the inning and stranding the runners. After three innings, the game was delayed due to darkness, and play resumed one week later to begin week two. 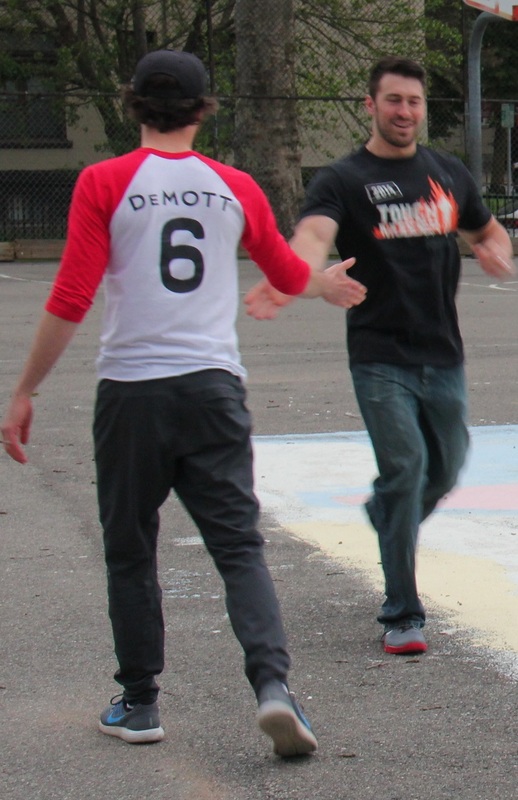 Nate Offut was entered into the Eastbound lineup for Mark, and Tom made his 2017 debut, replacing Norris in the Questionable lineup. One week later, BK remained on the mound for Eastbound, and after giving up a one-out single to Rairigh, he escaped the top of the fourth without damage, and the score remained 3-0. Miller replaced Norris on the mound, and after giving up a lead off single to Helal, he gave up another single to Nate. Unfortunately for Eastbound, Helal was caught in between first and second on the play, and Miller then retired Christian to end the inning. Questionable added to their lead in the top of the fifth. In his first at-bat of 2017, Kimble hit a towering bomb to left-center, and the solo shot made the score 4-0. Bob followed with a double, and two batters later, Miller hit a one-out double to drive him in, making the score 5-0. BK then retired Kimble to end the inning. Miller cruised through the bottom of the fifth, retiring Nate and striking out BK, as the score remained 5-0. Questionable tacked on two additional insurance runs in the top of the sixth. Bob led off with a double, and he moved to third when Rairigh followed with a double. With two runners on, Miller grounded out to center, but both Questionable baserunners scored on the play, and Questionable led 7-0. BK then retired Kimble to end the inning, and Eastbound trailed by seven heading into their final at-bat. 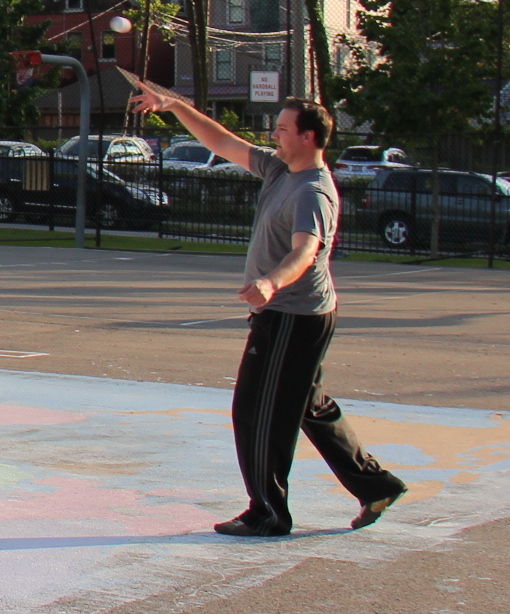 Rairigh closed out the game for Questionable, sealing the victory. He also went 4-for-6 at the plate with a single and three doubles. Rairigh took over for Miller on the mound, and he made quick work of Eastbound in the bottom of the sixth. 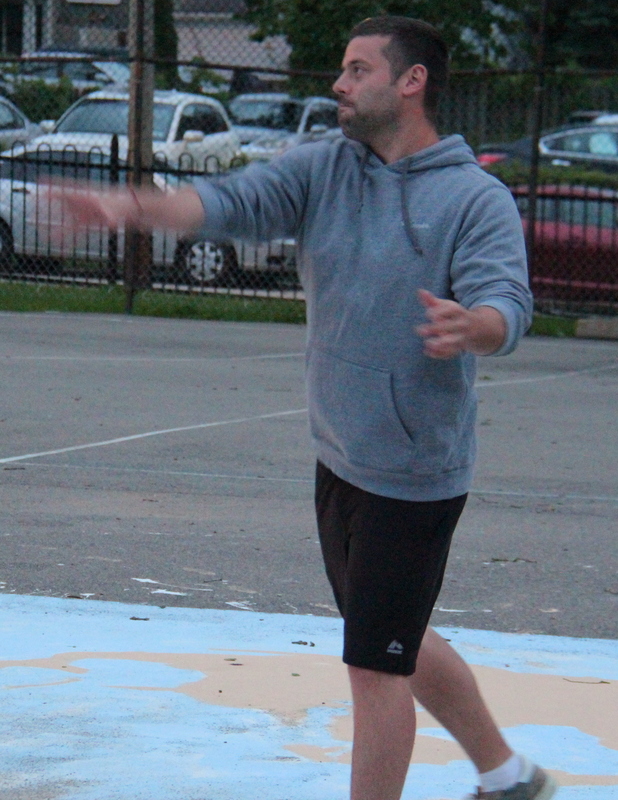 He retired Helal and Nate in order, ending the game and giving Questionable Outfit a 7-0 win. 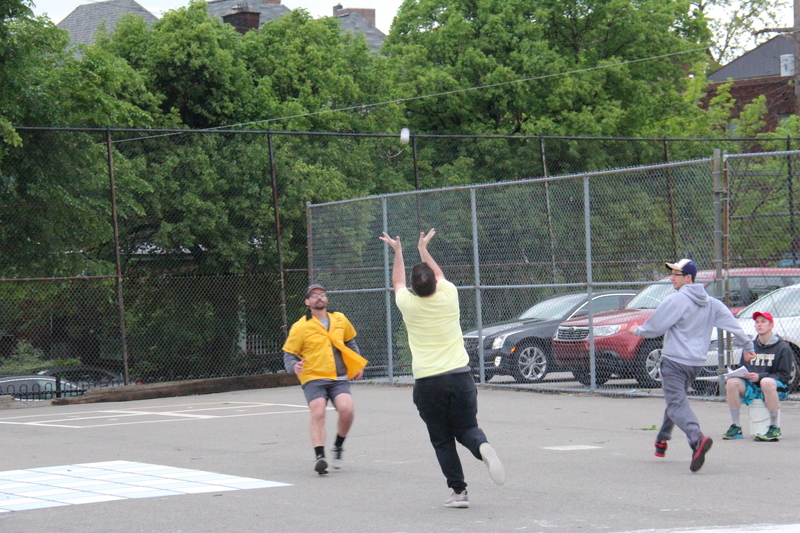 The win moved Questionable Outfit to 2-0 on the season, and Eastbound & Dahn fell to 1-1 with the loss. – Norris earned the win for Questionable, allowing two hits and no runs in three innings. Miller pitched two innings of scoreless relief, giving up two hits and striking out one. Rairigh pitched one inning of no-hit relief. – BK took the complete game loss for Eastbound, surrendering seven runs on twelve hits in six innings. 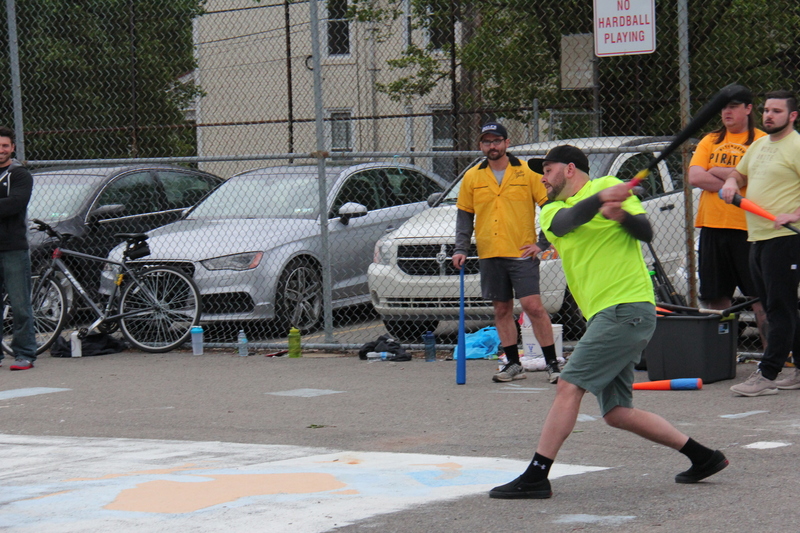 – Bob and Rairigh led Questionable Outfit at the plate, each going 4-for-6 with a single and three doubles. Bob scored three runs and drove in one, while Rairigh scored two runs and also drove in one. – Miller had four RBI in the game while going 3-for-6 with two singles and a double. – Nate, Helal, Mark, and Nate O each singled for Eastbound. Despite trailing late in the game, the Ham Slams rallied for five runs in the bottom of the fifth to pull ahead of Cookies & Cream and win 7-3. Steve hit for the cycle for the second time in his career to lead the Ham Slams at the plate, and Dustin pitched a complete game win. Dustin took the mound for the Ham Slams, and after giving up a one-out double to Blose in the top of the first, he retired Joey to strand the runner and end the inning. The Slams would get on the board in the bottom of the first. 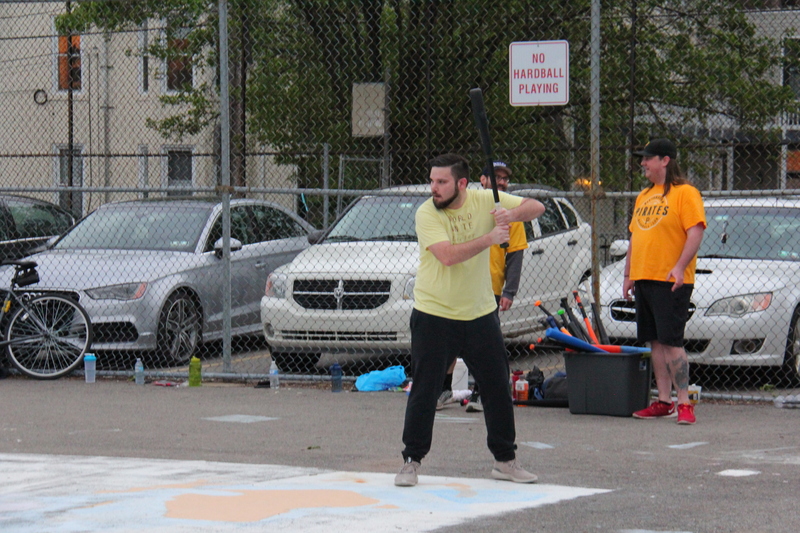 With one out, Erik accomplished a remarkable task, when he hit a solo homer to right and simultaneously threw his bat over the right field wall. It was likely the first time the feat had been accomplished in league history, and it put the Ham Slams ahead 1-0. Guthrie, the Cookies & Cream starting pitcher, then got Dustin to fly out to center to end the inning. Dustin rolled through the top of the second, striking out Dinger for the first out, and then retiring Jordan for the second. Guthrie matched him in the bottom half of the inning, retiring the side in order. Cookies would even things up in the top of the third. With one out, Blose hit a towering fly ball off the fence, and after a series of fielding errors, rounded the bases for an inside-the-park homer. Joey followed with a double, but Cookies couldn’t take the lead, as Dustin fanned Dinger for the second out of the inning. It looked as if the Ham Slams would take the lead back in the bottom of the third. Erik, Dustin, and Steve each singled to start the inning, and the bases were loaded with no outs. Guthrie got Josh to line out to center, and the next batter, Erik, grounded out to right. Guthrie had miraculously escaped the bases loaded jam, and the game remained tied at 1-1. Cookies would take the lead in the top of the fourth. Guthrie singled with out one out, and Blose hit his second consecutive inside-the-park homer in as many at-bats, putting Cookies & Crea ahead 3-1. Dustin then got Joey to fly out to left, ending the inning. The Ham Slams chipped back in the bottom of the fourth when Steve hit a one-out triple and scored on an RBI single by Josh. Guthrie retired Erik to end the inning, and the Slams trailed 3-2. Dustin retired the side in order in the top of the fifth, striking out Dinger for the third time in the game and getting Jordan to fly out to the mound. Down 3-2, the Slams got out their bats in a big way in the bottom of the fifth. Dustin singled to lead off, and Steve followed with a two-run homer, putting the Ham Slams ahead 4-3. Two batters later, Erik singled with one out, and he moved from first to third on a Dustin singled. Steve then doubled, scoring Erik, and the score was 5-3. Josh followed with an RBI double, clearing the bases and giving the Ham Slams a 7-3 lead. Erik followed with a single to put runners on the corners, and just when it looked like the game would get out of hand, Guthrie finally retired Dustin to end the inning. After leading 3-2 in the fifth, Cookies found themselves trailing 7-3 heading into their final at-bat in the sixth. 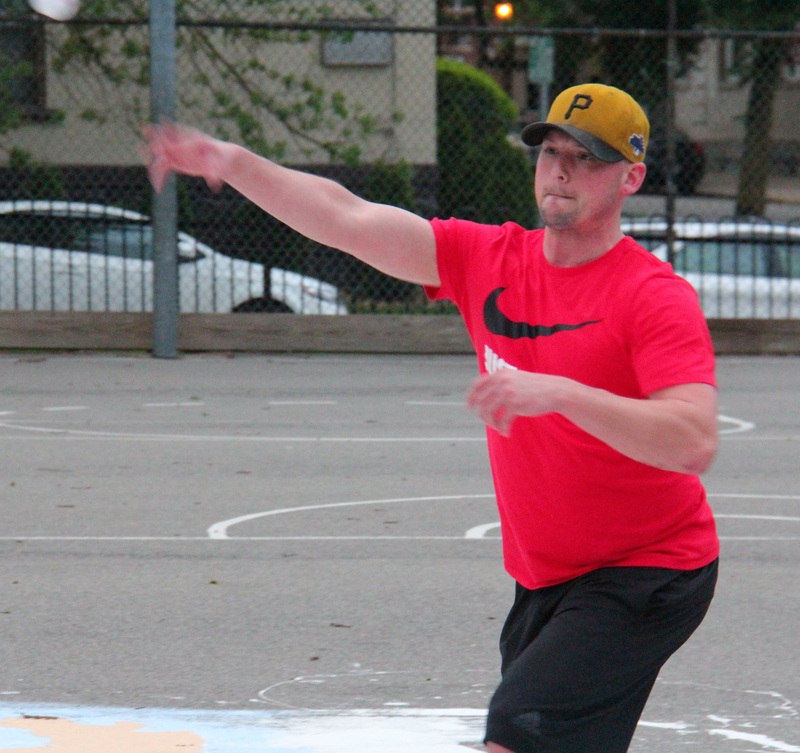 Dustin remained on the mound for the Ham Slams, and he closed out the game in quick fashion. He retired Guthrie and Blose in order, giving the Ham Slams the 7-3 come-from-behind win. 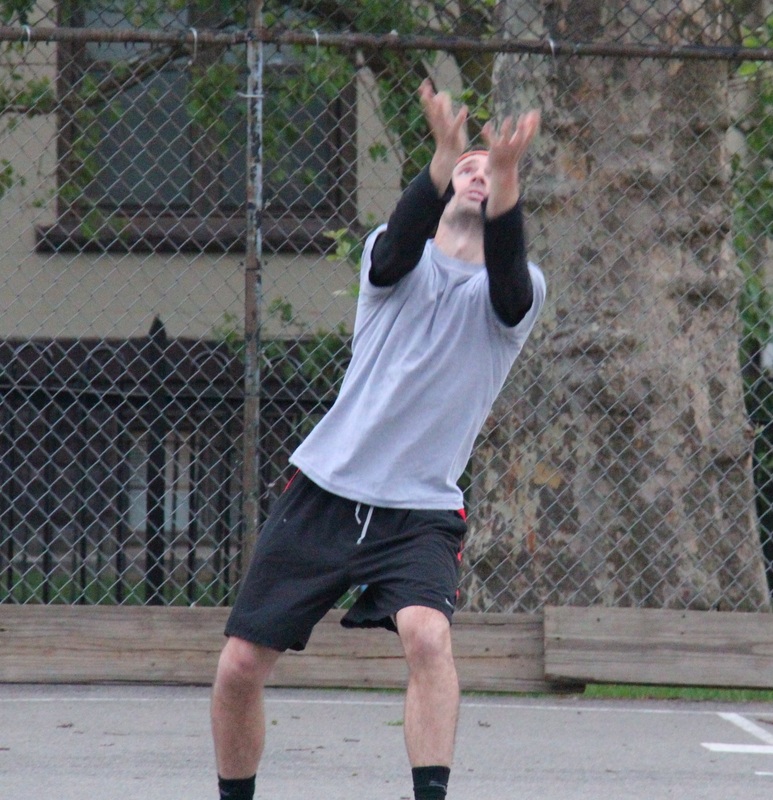 The win moved the Ham Slams to 1-1 on the year, while Cookies & Cream dropped to 0-2. – Dustin pitched the complete game win for the Ham Slams, allowing three runs on five hits in six innings. – Dustin tied the single-game regular season record for strikeouts, with three. Christian also tied this record earlier in week 1. – Guthrie took the loss for Cookies & Cream, giving up seven runs on thirteen hits in five innings. – Steve led the Ham Slams at the plate, hitting for the cycle while going 4-for-5 with a single, a double, a triple, a home run, three runs scored, and three RBI. – Erik went 4-for-6 for the Ham Slams with three singles, a home run, three runs scored, and an RBI. 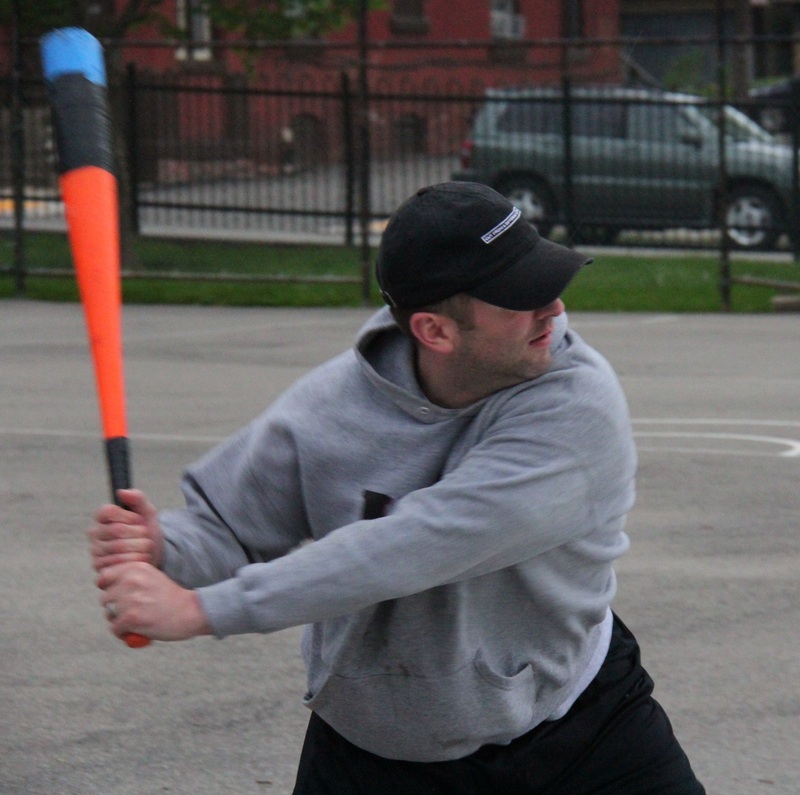 – Blose led Cookies & Cream on offense, going 3-for-4 with a double, two home runs, two runs scored, and three RBI. The three-time defending EWL champions picked up where they left off in the summer of 2016, scoring in every inning against the Ham Slams in an 8-1 victory. Bob and Rairigh each contributed four hits, Miller pitched a gem in his first start of the year. 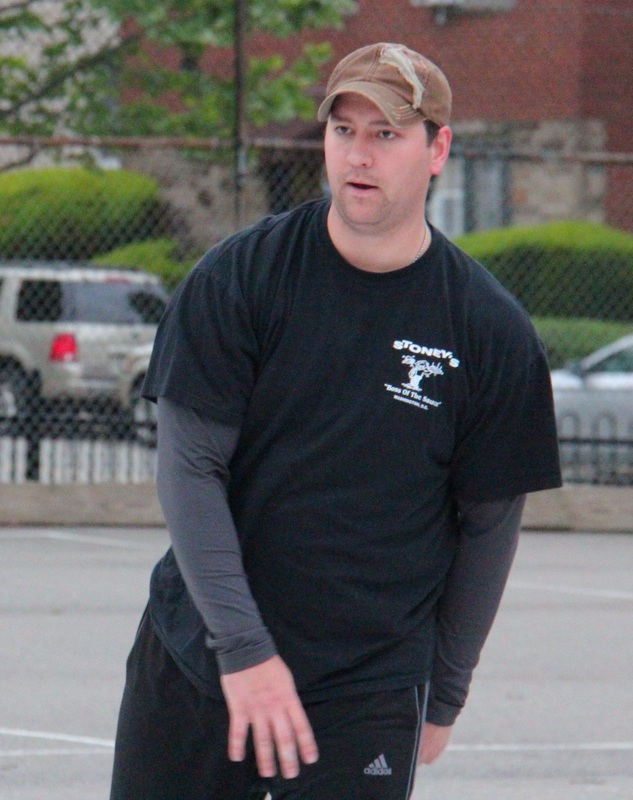 EWL rookie, Norris, contributed two hits, replacing Questionable Outfit mainstay, Kimble. Miller, who had a stellar rookie campaign on the mound in 2016, started for Questionable Outfit and retired the side in order in the top of the first. The 2016 EWL co-rookies of the year would face off against each other on the mound in this game, as Josh took the mound for the Ham Slams. He got into trouble early thanks to Questionable Outfit’s big bats and some Ham Slams’ fielding errors. Bob led off with a double, and Rairigh immediately put Questionable ahead with a two-run shot to left, making the score 2-0. Two batters later, Norris would single in his first career at-bat, but Josh limited the damage, getting Bob to ground out to center, stranding the runner after allowing only two runs. The Ham Slams cut the lead in half in the top of the second. With one out, Erik, making his first career EWL at-bat, and playing for a team he was not originally slated to suit up for, hit a towering blast to right. Miller then retired Josh to end the inning, and Erik’s solo shot had cut the score to 2-1. Miller got the run back for himself in the bottom of the second, when he hit a one-out solo homer, making the score 3-1. Josh then retired Norris to end the inning. Steve, making a return to the Ham Slams after missing most of the 2016 campaign, led off the top of the third with a triple. The Slams couldn’t plate a run, however, as Miller fanned Dustin and then got Erik to ground out to right to end the inning. Questionable extended their lead in the bottom of the third. Bob and Mike each singled to put runners on the corners with no outs, and Miller drove in Bob with an RBI single to make the score 4-1. With runners on the corners again, Norris grounded out to left, but Rairigh scored on the play. Bob hit his second single of the inning to yet again put runners on the corners, but Josh escaped the jam, getting Mike to ground out to left to end the inning. Down 5-1, Josh singled to lead off the top of the fourth. As he tried to extend the hit into a double, Miller pegged him from across the diamond for the first out of the inning. Steve followed with a double, but was stranded at second when Dustin grounded out to left to end the inning. Questionable continued to score in the bottom of the fourth. Miller led off with a double, and two batters later, Bob hit a two-run bomb to right, his first of the year. Rairigh followed with a double, but Josh retired Miller to end the inning with the score 7-1. Miller cruised through the top of the fifth, retiring Erik and Josh in order. Norris started the bottom of the fifth with a double, and two batters later, Rairigh hit his second double of the game, scoring Norris to make the score 8-1. Josh then retired Miller to end the inning, and the Slams trailed by seven. Miller remained on the mound to close things out in the top of the sixth. He struck out Steve for the first out of the inning, and then got Dustin to fly out to right, ending the game and giving Questionable Outfit the 8-1 win. 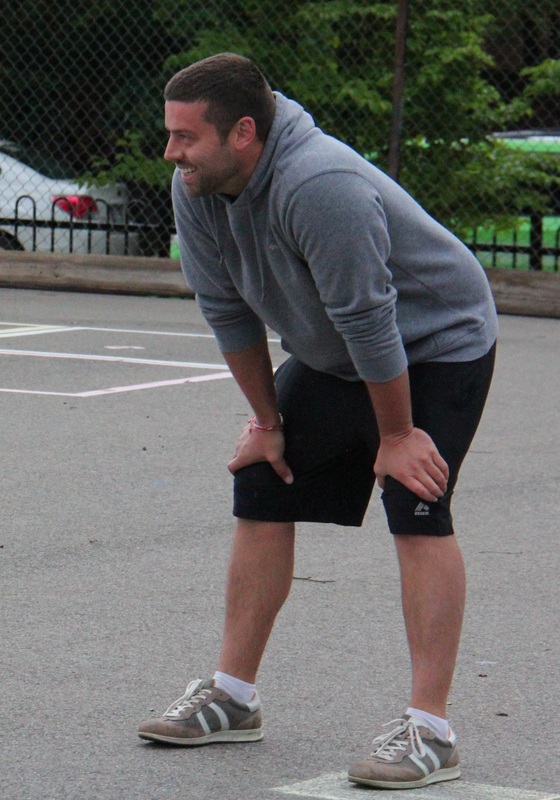 The win moved Questionable Outfit to 1-0 on the season, while the loss dropped the Ham Slams to 0-1. – Miller pitched the complete game win for Questionable Outfit, allowing only one run on four hits and striking out two in six innings. 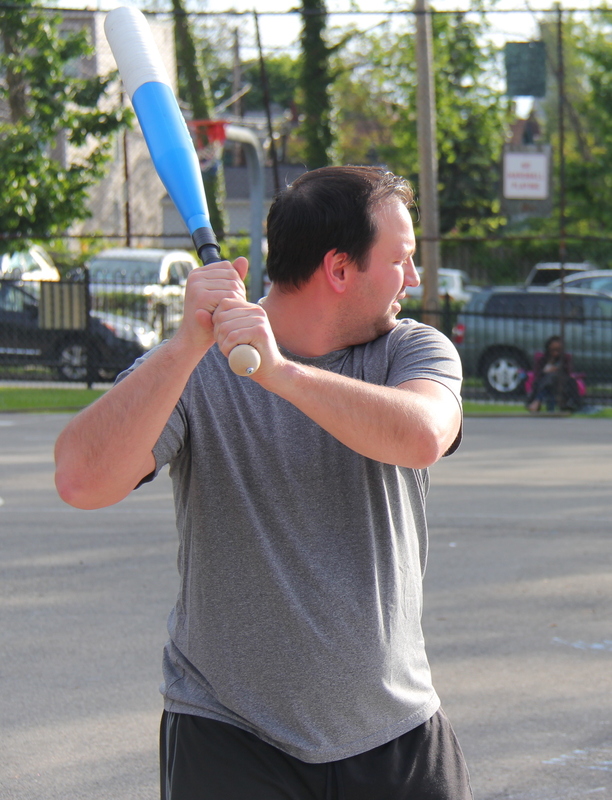 – Josh took the loss for the Ham Slams, giving up eight runs on thirteen hits in five innings. – Bob and Rairigh led Questionable Outfit at the plate. They each went 4-for-6. Bob had two singles, a double, a home run, three runs scored, and two RBI. 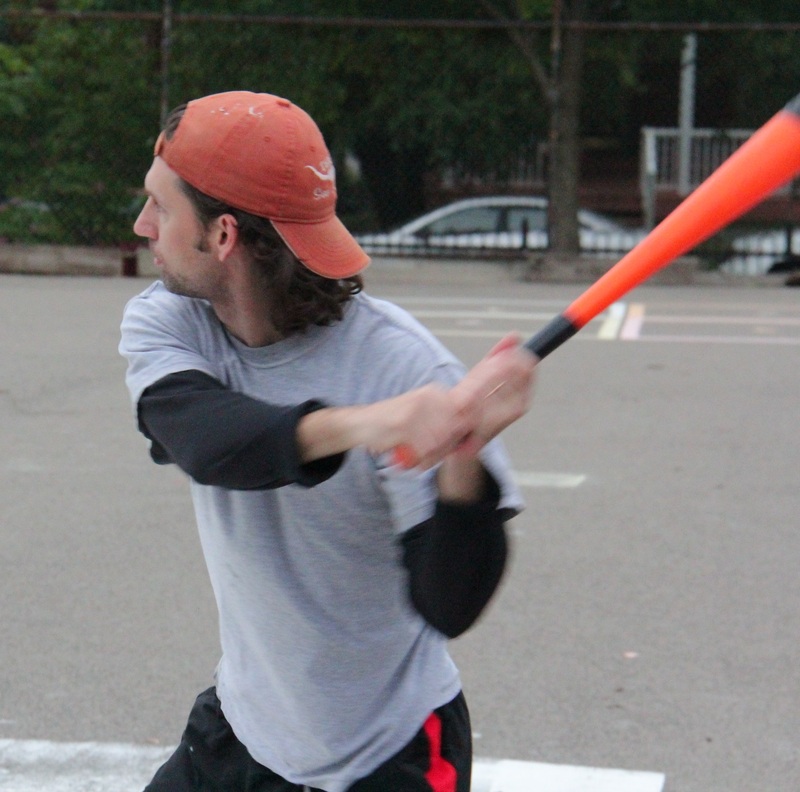 Mike had a single, two doubles, a homer, two runs scored, and three RBI. – In his first career game, Erik led the Ham Slams. He went 1-for-3 and produced their only run with his solo homer in the second inning. Mark’s three-run homer in the bottom of the fourth was his first career hit, and tied the game at 3-3. After trailing the majority of the game, Eastbound & Dahn came from behind to start their season with a win, beating Cookies & Cream 4-3. Mark, making his EWL debut, hit a late three-run homer to tie the game, and Christian’s RBI double in the bottom of the fifth put Eastbound ahead for good. After finishing the 2016 regular season 2-18, Eastbound has half of the season win total from last year after only one game. Once the field had cleared following the ceremonial first pitch, Eastbound & Dahn took the field with Christian on the mound. EWL veteran Guthrie led off for Cookies & Cream, and with help from swirling winds, Christian struck him out for the first out of the inning. Blose doubled with one out, but Christian got Joey to fly out to center, ending the inning and stranding the runner. Dinger took the mound to start the season for Cookies & Cream, and he retired Christian and Nate in order in the bottom of the first. Christian, who earned the complete game win for Eastbound & Dahn, delivers a pitch to Guthrie of Cookies & Cream early in the season opener. Cookies would get on the board in the top of the second and score the first runs of the 2017 EWL season. With one out, Jordan singled, and he moved from first to second on a Guthrie single. Blose followed with an RBI double, clearing the bases to make the score 2-0. Blose was caught trying to extend the hit into a triple, ending the inning. Helal would single with one out in the bottom of the second, but Eastbound couldn’t plate a run, as Dinger retired Mark to end the inning. Joey led off the top of the third with a double, but Christian avoided further damage. He struck out Dinger for the first out of the inning, and then got Jordan to ground out, stranding the runner in scoring position. Dinger continued to make quick work of Eastbound in the bottom of the third, retiring Christian and striking out Nate to end the inning. Cookies would add to their lead in the top of the fourth. Guthrie and Blose each singled to start the inning, and with runners on first and second, Joey doubled, scoring Guthrie from second. Cookies had runners at the corners with no outs, and it looked as if they would blow the game open. But Christian bukcled down, getting Dinger and Jordan to each fly out to the mound, stranding two more Cookies runners, and the score was 3-0. Eastbound finally got on the board in the bottom of the fourth. BK and Helal each singled to start the inning, and in only his second career at-bat, Mark crushed a three-run blast, tying the game at 3-3. Christian followed with a single, but Eastbound couldn’t take the lead, as Dinger retired Nate and BK to strand the runner at first. With the game tied at 3-3, Christian got back into a groove on the mound. He retired Guthrie and Blose in order in the top of the fifth, maintaining the tie. Helal started the bottom of the fifth with a single, his third consecutive hit, and he moved from first to third on a Mark single. With no outs and runners on the corners, Christian helped his own cause, hitting an RBI double to score Helal and put Eastbound ahead 4-3. Eastbound had a chance to extend their lead, but Dinger retired Nate and BK to strand two runners, ending the inning. Christian provided his own run support in the bottom of the fifth, hitting the game-winning RBI double which put Eastbound ahead 4-3. Up 4-3, and two outs away from a season opening win, Christian continued to roll in the top of the sixth. He got Joey to ground out to center for the first out of the inning, and then struck out Dinger to end the game, giving Eastbound & Dahn a 4-3 victory. 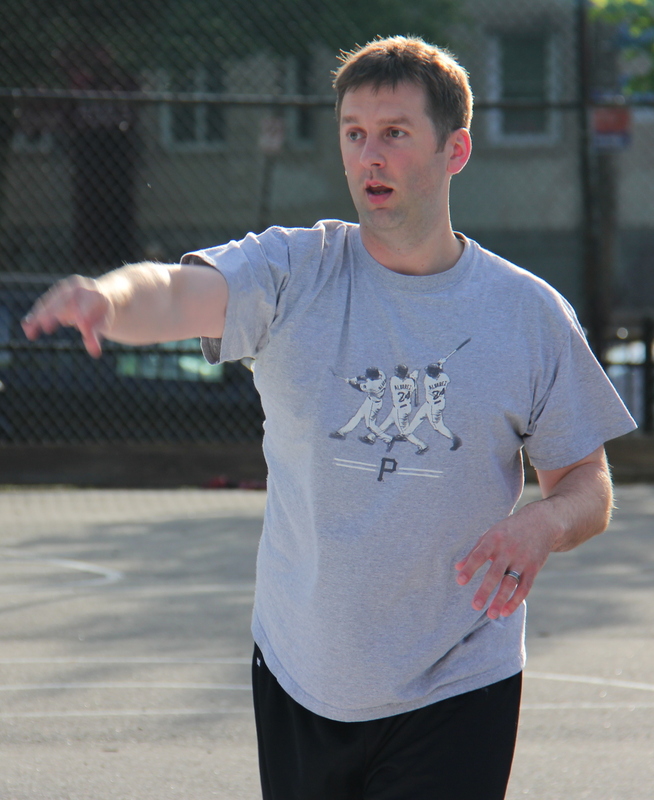 Eastbound & Dahn moved to 1-0 on the season, while Cookies & Cream dropped to 0-1. – Christian pitched the complete game win for Eastbound & Dahn, allowing three runs on eight hits in six innings. – Christian also tied the EWL single-game regular season record for strikeouts, with 3. – Dinger took the complete game loss for Cookies & Cream, giving up four runs on eight hits and striking out one in five innings. – Helal led Eastbound & Dahn at the plate, going 3-for-3 with three singles and two runs scored. – Mark also went 2-for-3 for Eastbound, with a single, a homer, a run scored, and three RBI. – Blose led Cookies & Crea at the plate, going 3-for-4 with a single, two doubles, and two RBI.